The polo pitch in Bishopland Polo, Ballymore Eustace was the battle ground for the Ladies match last Wednesday (5th Sept 2018). Black Team: Digital Built Consultants (Jimmy Byrne (honorary lady for the evening), Clodagh Brophy, Emma Hayes, Felicity McCartan) took on Yellow Team: Hollywood Horse and Pony Trekking (Aishling Doyle, Karyn Jamieson, Geraldine (Ger) McCarthy, Noella Beaumont) in an exciting match of two ten minute chukkas. The game was closely umpired by Bishopland Polo owner Alejo Aita Tagle and local Equine Vet James Sheeran. The tournament closes the beginner’s polo season, where under Alejo’s expert and patient coaching along with his experienced polo ponies, keen horse riders can get a taste of the very exciting sport of polo. The teams battled it out for the prestigious Bishopland Polo medals sponsored by local business Digital Built Consultants (www.digitalbuiltconsultants.com). The teams lined up for the throw in from Umpire James Sheeran which kicked off the first match of the Bishopland Polo Beginners Tournament. Team Digital Built Consultants took an early lead with a goal scored in the first few minutes of play by hard hitter Jimmy and his agile polo pony. Following the rules of polo the teams switched sides after a score. Hollywood Horse And Pony Trekking (HHPT) played well to defend against the goal hungry Digital Built Consultants (DBC) team for the next few minutes. A brave tackle from Ger and a pass to Aishling gave HHPT a chance at goal but DBC’s defence was too much for HHPT. A foul by DBC gave HHPT another chance at goal with a penalty shot but the ball was wide. The ten minute chukka could not end soon enough for HHPT after a pass from Clodagh to Jimmy ended in another goal for DBC. Heavy rain did not deter the two teams from battling it out to the end of the first chukka but all were relieved when the whistle blew. After a ten minute break sheltering from the rain in the back of James’ horse lorry and few refreshments the rested polo ponies and riders braved the slippery ground conditions for the second and final chukka (the professionals play four chukkas with a different pony for each chukka). Once again, the teams lined up for the throw in and HHPT won the ball. Aishling cantered up the field towards their goal with Karyn supporting and defending the whole way but a tackle by Emma passed the ball back to Clodagh who took off at full speed towards the goal where Jimmy completed the play by putting the ball between the goal posts for a third time. Keen marking by Felicity and Noella kept the pressure on both teams throughout the match but Team Digital Built Consultants where not to be beaten with a final goal by their hired assassin Jimmy Byrne to seal the deal. The final score was Team Digital Built Consultants – 4: Team Hollywood Horse and Pony Trekking – 0. 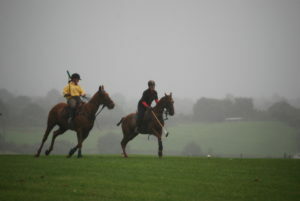 The next match of the Bishopland Polo Beginners Polo Tournament will be held on the 13th September between the beginner’s men’s teams of the West Wicklow Hunt and South County Dublin Hunt.